Enjoy this scrumptious spicy beef ramen noodle soup right at home. This ramen soup is made with a spicy flavorful broth, fresh veggies, and soft boiled eggs. Prepared in 30 minutes or less. It is very light and especially easy to make. The key to any delicious soup, like this one, and my soup joumou, Panera Bread broccoli cheddar soup, butternut squash soup, and my classic tomato soup, is all in the broth and the ingredients that are used. The key to good comforting soup is the homemade stock and all the love that goes into it. As you know, I don’t always have time to prepare 3-course meals– and I love my quick dishes. Though I often use store-bought stocks, I still find ways to enhance the flavor just a little more. Just to give it that extra oomph to amplify the flavors. 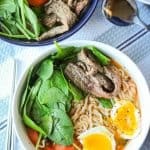 This 30-minute ramen noodle soup is for those days and nights when you need a comfy, quick healthy dinner, but without all the fuss in the kitchen. The soup was made using the ingredients I already had in my pantry and refrigerator. It’s somewhat spicy because of the sriracha sauce, filled with veggies but not overwhelming, beef strips, eggs for extra protein, and of course, ramen noodles. Prior to making this soup months ago, I was never a fan of runny eggs or soft cooked eggs. 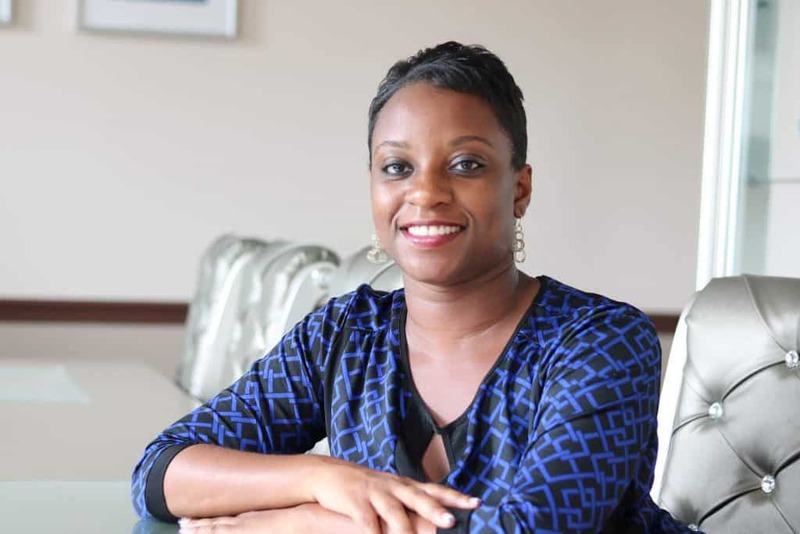 My husband dared me one day to try it, and…..guess what? It wasn’t bad. Definitely not what I imagined it to be. One thing for sure, I could taste the “egg” when they are cooked in this manner. I’ve always enjoyed comforting food; especially during the cold season. This year, I find myself to be even more indulge in soupy foods. 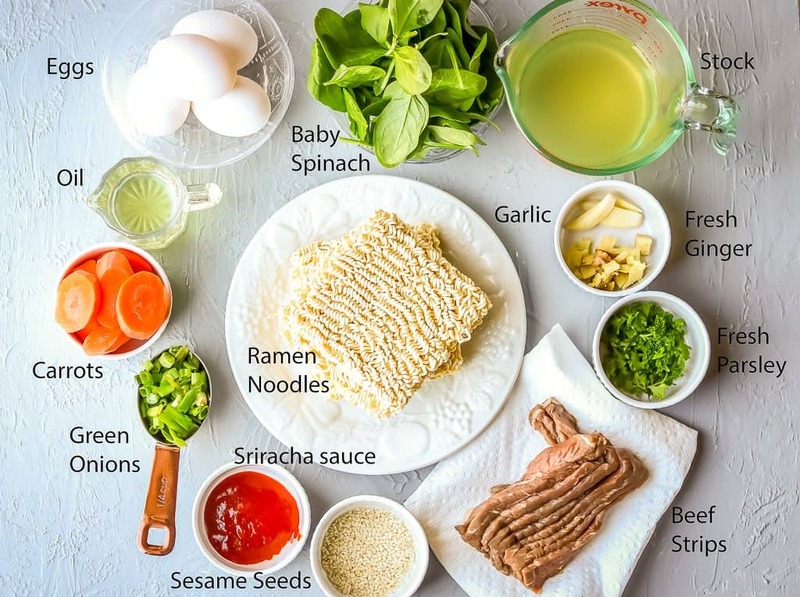 Why this ramen noodle soup recipe works and how do you make ramen soup from scratch? Everything is cooked in one pan for the most part. It is ready in 30 minutes. It is filling, and it satisfies all taste buds. 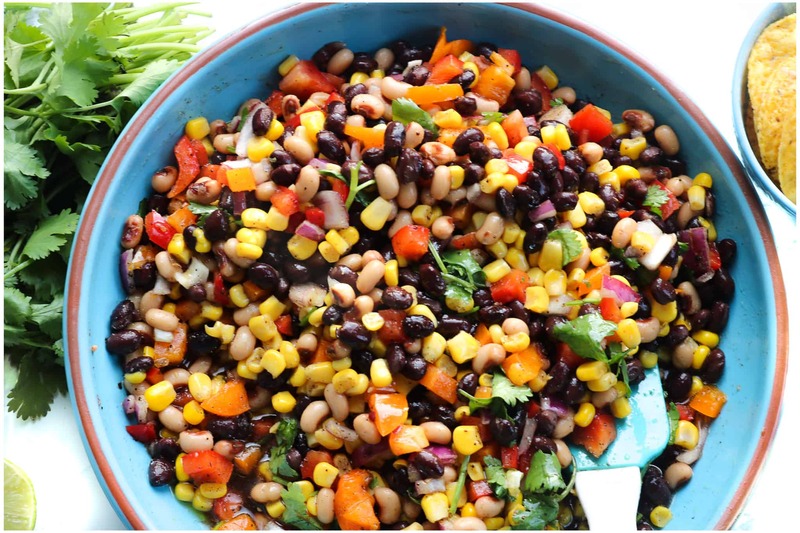 This recipe works well for those who are on a strict budget and it is also customizable. Here’s how to make it: First, gather the ingredients. 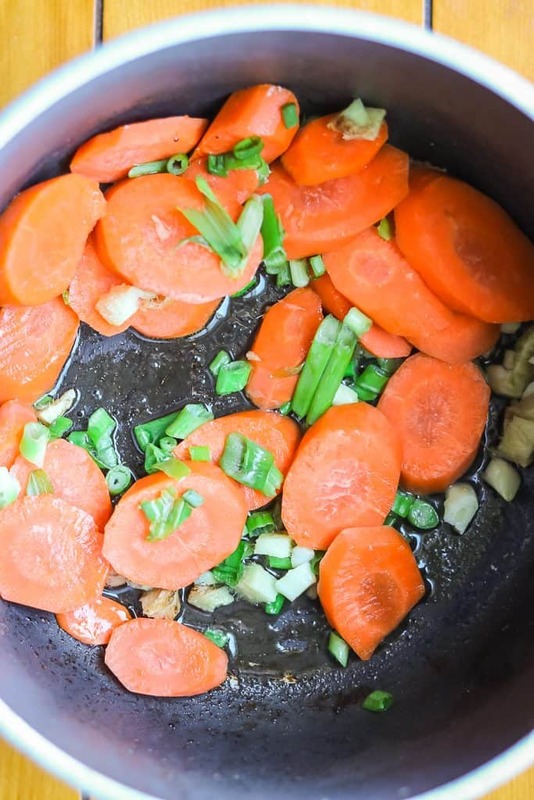 Cook the carrots, ginger, garlic, and green onions in a pan for about 5 minutes. Add the remaining ingredients and bring to boil. Meanwhile, this is the perfect time to cook the eggs. Then cook the beef in a separate skillet in accordance to your level of consistency. Set the beef aside in a warm place. What can I add to ramen noodle soup? There’s so much you can add to ramen soup. Hence the reason why I like this recipe, or ramen noodle soups, period. You can make it your own. You can add eggs, vegetables, eat it with more bread if you love carbs, add peas, you can have it with additional soy sauce, greens, and meat of your choice. The possibilities are endless. The key to having a great ramen soup is to find ways to customize it to your liking. If you loved this ramen soup recipe, then you’ll love my vegetable lo Mein. Did you make this Spicy Beef Ramen Noodle Soup recipe? Tag me on Instagram or Facebook and please give it a star rating below! 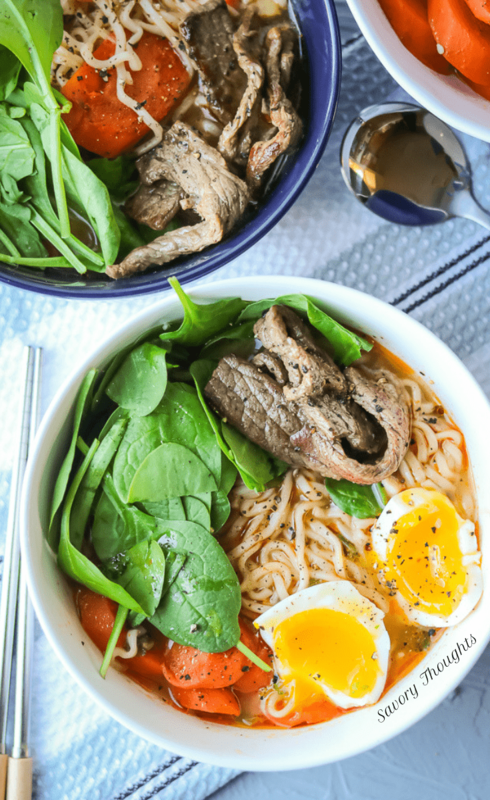 SAVE THIS SPICY BEEF RAMEN NOODLE SOUP RECIPE TO YOUR PINTEREST BOARDS! Enjoy this scrumptious Spicy Beef Ramen Noodle Soup right at home. Authentic, and delicious ramen soup. Full of flavor and spice. Top with beef and veggies. In a medium pan on medium heat, add the oil, onions, carrots, ginger, and garlic. Fry for about 5 minutes. Add stock and water. Let boil until carrots are cooked through. Add the remaining ingredients including noodles. cook for 10 minutes. Cook the steak to your desired texture. 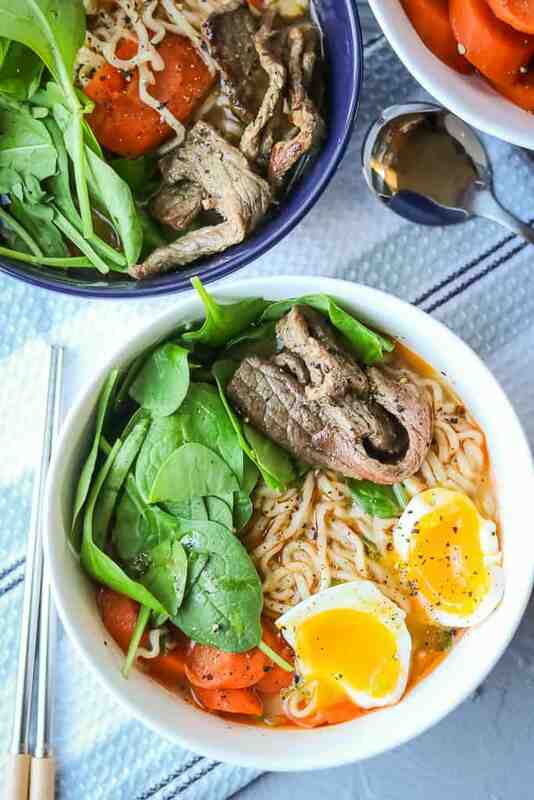 Add the ramen soup to a bowl, topped with eggs, spinach, and beef. Serve warm. For best result when cooking the eggs, cook the eggs for no more than 6 1/2 minutes. Cook the beef last for best texture. I love ramen! This healthier version looks so good. This looks absolutely delicious! I think I could make this with zucchini noodles! My husband is a ramen fanatic. I bet he would love this! What a great way to spruce up packaged ramen noodles. Perfect for winter. I am a noodle lover. This bowl of noodles would be perfect for the weekend. We are getting more crappy weather. This is just what we need to warm up with. Yes, it is great for those unpleasant weather. This spicy ramen looks like an easy and delicious weeknight meal for these cold winter days. I love the use of instant ramen noodles for extra ease! I have toz to say that this is a healthy looking soup plus siracha, I’m sold. There’s nothing like giving your soup a kick, thanks for sharing! I so want to make this recipe and the fact it takes 30 minutes in one pan is perfect. I’m addicted to Ramen and love your recipe!! So simple yet so much flavor! This looks so delicious! I love all the flavors you’ve put together and it’s so nutritious as well! Those eggs are cooked to perfection! Love that jammy texture. Definitely have to give this recipe a try over the winter months. They look delicious! So perfect for colder months! Super yummy! I like making extras of ramen dinners to pack in school lunch thermoses thenext day! 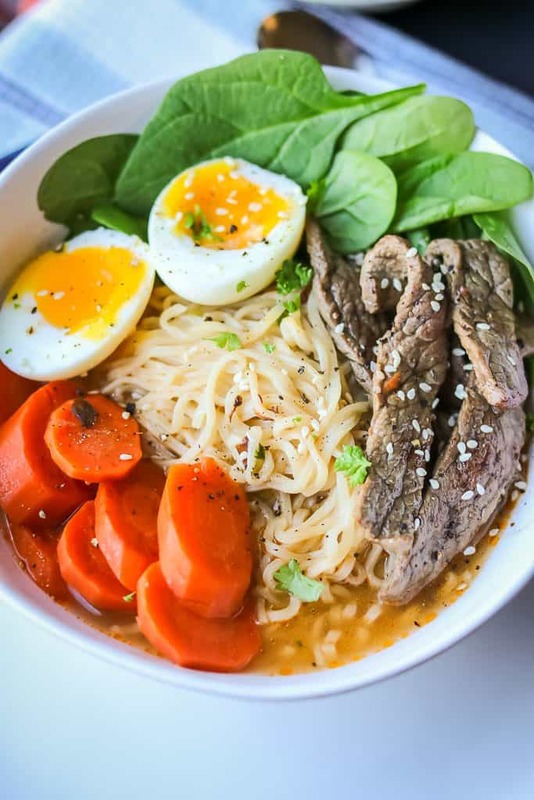 Ramen noodle soup is such a fantastic way of upping our lunch game! It’s so quick and versatile. Your version sounds so yummy, and beautiful photos too! Thank you, Mari! I love Ramen noodle soup. I want to make this right now! I love that it is full of all my favorite veggies and flavors. I can’t wait to make this for my family. You will enjoy it! Thank you, Kelly! Yummy, love eggs, broth, noodles and veggies, such a great big lunch or dinner or even breakfast! I love the inclusion of eggs in this ramen noodle soup! This is a great weeknight meal! What a great way to have ramen! I love spicy delicious soups for my lunches. It is well below zero here and I would love a big bowl of this to keep warm. The egg and beef look incredible! I love soft boiled eggs in my ramen. You should try some miso soft boiled eggs. They would go great with this recipe! What a great collection you have manage tu put inside. I would have never thought of boiled eggs. Have to try it. I love a big bowl of noodles and broth on a chilly day! This looks like it would be perfect! 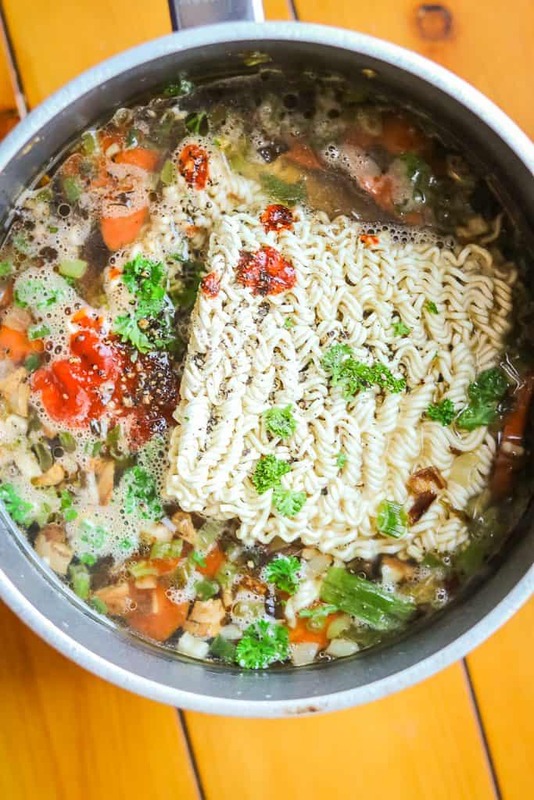 This Ramen noodle soup is healthy, I would love to make it. I can’t imagine how easy it is to make this deliciuos ramen noodle soup. And it has everything I like so I am definitely one of this recipe’s fans now. So yum! Authentic ramen soup is so much more complex than most people know, and wow, I love it! Thanks for sharing this recipe. It’s a good one! This looks fabulous! I love noodles in any form. I think it would taste good with chicken too. Lovely recipe!! 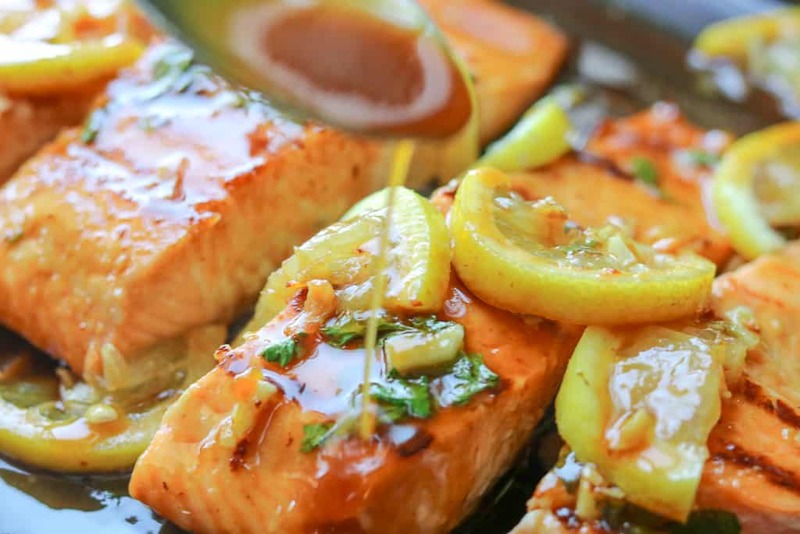 Love the garlic and ginger and Sriracha for a kick! 30 minute ramen? Yes, please. That’s quicker than going to the local ramen restaurant! 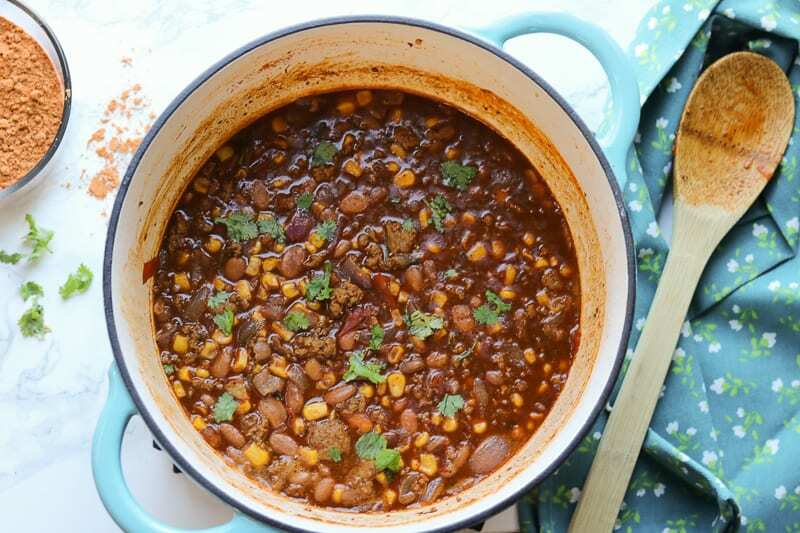 Love that this recipe develops so much incredible flavor in so little time! Awesome recipe! Thank you, Krista! It is very flavorful.